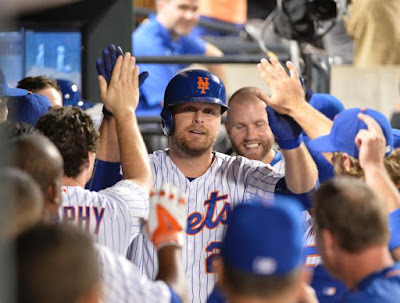 May 21st: As the second place Mets took on Mike Matheny's first place St. Louis Cardinals, Duda had the first of his seven multi HR games on the year. Duda first homered against Jaime Garcia in the 6th inning, a solo shot. In the 9th he bklasted a three run shot off Randy Choate, icing the Jacob deGrom 5-0 shut out. Less than a week later, Duda had his second multi HR game of the year. This came during a stretch from May 21st to May 30th where he hit six HRs driving in ten runs. On May 27th the Mets hosted the lowly Philadelphia Phillies, already ten games out of first place. As Noah Syndergaard coasted to a 7-0 shut out, getting 9th inning help from Sean Gilmartin & Erik Goeddel. Duda hit two solo shots one in the 1st inning & another in the 5th. 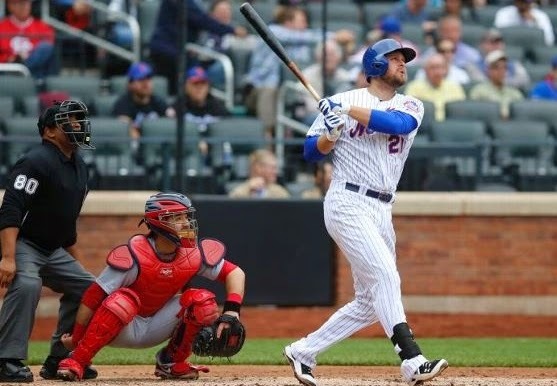 On Saturday July 25th Duda began a big week. 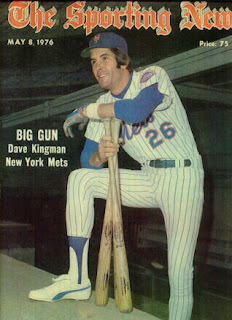 The second place Mets hosted Don Mattingly's first place Los Angeles Dodgers. In an NLDS preview, the Mets pounded the Dodgers tonight 15-2 while smashing 21 hits. Duda hit a pair of solo HRs, getting to 14 HRs on the year. After already hitting three HRs on the week, Duda had his biggest HR night of the year on July 29th. Duda led off the 2nd inning with the first of three solo shots. Another followed in the 6th & then another in the bottom of the 9th in the Mets 7-3 loss to the San Diego Padres. Three games later on August 1st, the Mets hosted the Washington Nats in a big series at Citi Field. 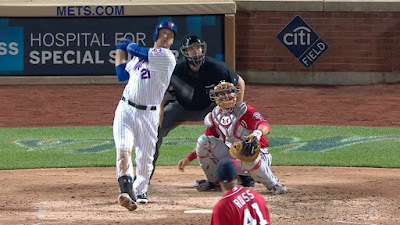 The Mets were two games back of Washington & would sweep the series while taking over first place for good. In the 4th inning, Duda hit his 19th HR of the season, a solo shot off Joe Ross. In the 7th he connected off Ross again for his 20th HR of the season. Duda would hit another HR the next night helping lead the Mets to a 5-2 win. Duda missed some time in August due to a back injury. He would not hit another HR for a month in a half, September 18th. On September 25th he had his biggest RBI night of the year, driving in six runs. At this point Terry Collins Mets (87-67) were counting down to clinching the NL East with a magic number of two. The Mets were in Cincinnati having a big night as they beat the Reds 12-5, getting to within a game of their NL East Title. 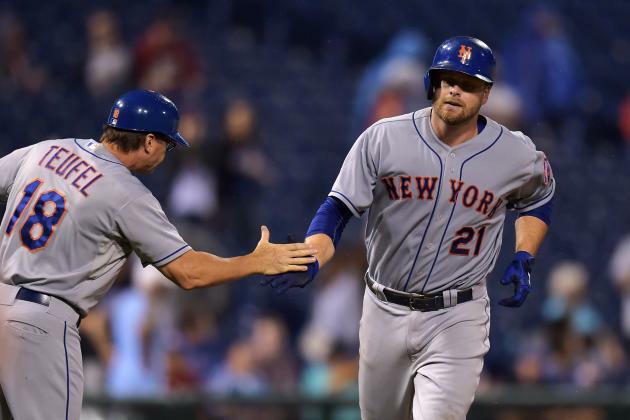 Lucas Duda had the biggest night of Mets batters & one of the biggest nights of his career. Duda had a pair of three run HRs with six RBIs (giving him 66 on the year). In the 3rd inning, Daniel Murphy doubles & Yoenis Cespedes singled putting two men aboard for Duda. He hit the first of his two run HRs #23 on the year for him. In the 7th with the Mets up 4-0, Duda came up with David Wright on board & Murphy who had just singled in Curtis Granderson. Duda hit his second three run HR of the night putting New York up 9-0. On September 29th, with the Mets now reigning NL East Champions, they were in Philadelphia playing the last place Phillies. 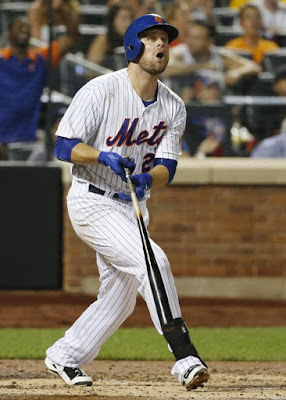 On this night the Mets took a 4-3 loss but Lucas Duda tied a franchise record with his seventh multi HR game of the year. Duda homered twice, a solo shot off David Buchannon & then his 27th of the season, a two run shot off Ken Giles. Duda joined former Mets sluggers Dave Kingman (1976) & Carlos Delgado (2008) as the only three Mets players to have seven multi HR games in a season. Duda would finish with 27 HRs on the year.